The last Molé Monday post! 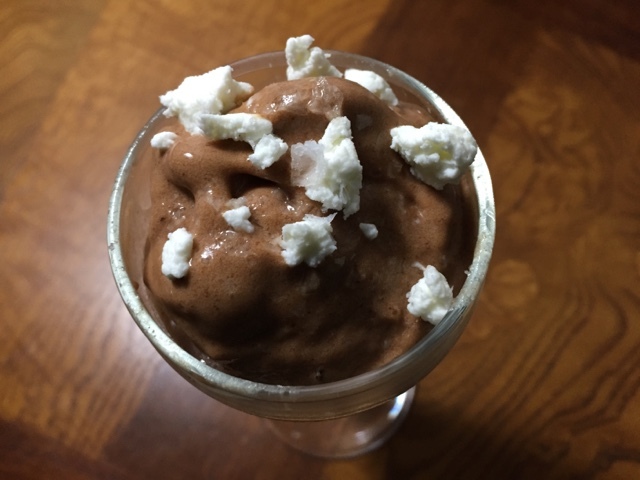 Molé Chocolate Coconut Nice Cream Recipe. Dairy Free Ice Cream!! Bonus...gluten free too! Add 2 Tablespoons Mole spice to 1/2 cup coconut milk and bring to a simmer. Remove from heat and strain to remove large spice pieces. Add 1/4 cup chopped chocolate to the hot coconut milk mixture and let it melt then stir to combine. Put 3 frozen bananas into a food processor with a blade. Whir for several minutes until totally blended. Add 1/4 cup of cooled coconut milk chocolate mixture to the bananas and whir until it is the consistency of soft serve ice cream. Serve topped with crumbled goat cheese and flake salt. I'm not sure who won the title of Molé Master but it has been fun and challenging to come up with recipes to try to beat Becca and the others involved in Molé Monday.